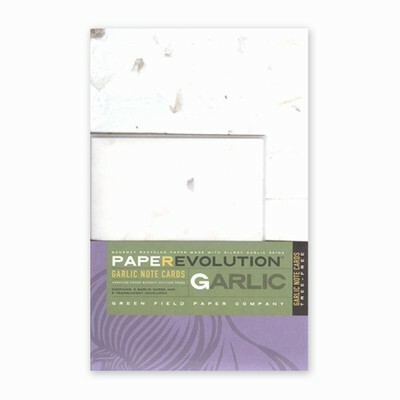 This recycled handmade paper has visible pieces of garlic skins from Gilroy, CA dispersed throughout. Celebrate the art of personal correspondence with these notes for any occasion. The intimate A2 size is perfect for any occasion. They are scored for precise folding. Each note set contains 5 cards and 5 translucent envelopes that allow the beauty of the paper and whatever you apply to it to peek through. 100% recycled and tree-free.